• Ice cover on the Thames River has now broken up from Delaware through Chatham and is moving downstream. This may cause minor ice jams. 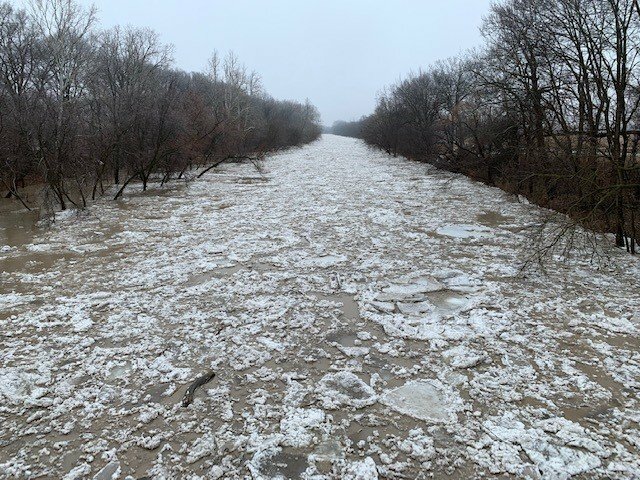 • Water levels on smaller local watercourses are now dropping but ice, snow, and debris blockages and related flooding are possible. • Thames River will continue to rise and flood the low lying river flats from Delaware down to Chatham. • The sidewalk along the Thames River in downtown Chatham will continue to be submerged over the next few days. • Rain in the forecast will keep water levels high and add to local flooding. Over the last few days the Thames River watershed has experienced a warm spell. The warm temperatures have melted all of the snow in the Lower Thames watershed and most of the snow in the Upper Thames watershed. In addition to the melted snow and previous rainfall, the Lower Thames watershed received 5 to 15 mm of additional rainfall in the last 24 hours. As a result, water levels on local watercourses and the Thames River are elevated. The Thames River is expected to continue to rise and flood the low lying river flats from Delaware down to Chatham as water is routed through the system. As a warm front moves through on Thursday, temperatures are expected to rise and bring an additional 5 to 10 mm of rain. On the region’s smaller watercourses, water levels had risen, started to drop, and are rising again from Wednesday’s precipitation. Many have approached bank full conditions. In some areas, blockages of ice, snow, and debris had caused water to spill out of their banks. Water levels are still high and should be expected to remain high over the next few days given the rainfall forecasts. The potential still exists for further ice blockages and localized flooding. Water levels on the Thames River in the City of London peaked late Tuesday night. The amount of water leaving the Upper Thames watershed will cause flooding of the low lying river flats adjacent to the river from Delaware down to Chatham. The Thames River is expected to peak in Chatham on Friday. The walkways along the river in Downtown Chatham have already been submerged due to local rainfall and ice conditions. At the mouth of the Thames River in Lighthouse Cove, ice cover varied from 5 to 20 cm thick this morning with some open areas. Upstream through the Chatham area, ice cover was approximately 5 to 15 cm thick. Ice cover on the Thames River has now broken up from Delaware down to Chatham and the leading edge is now moving through the city of Chatham. No major ice jams on the river have been observed. However, there is potential for minor ice jamming as the ice pushes its way downstream which could lead to higher than expected water levels and additional water in the flood flats. The additional rainfall in the forecast would raise water levels even further and could lead to more ice jamming.